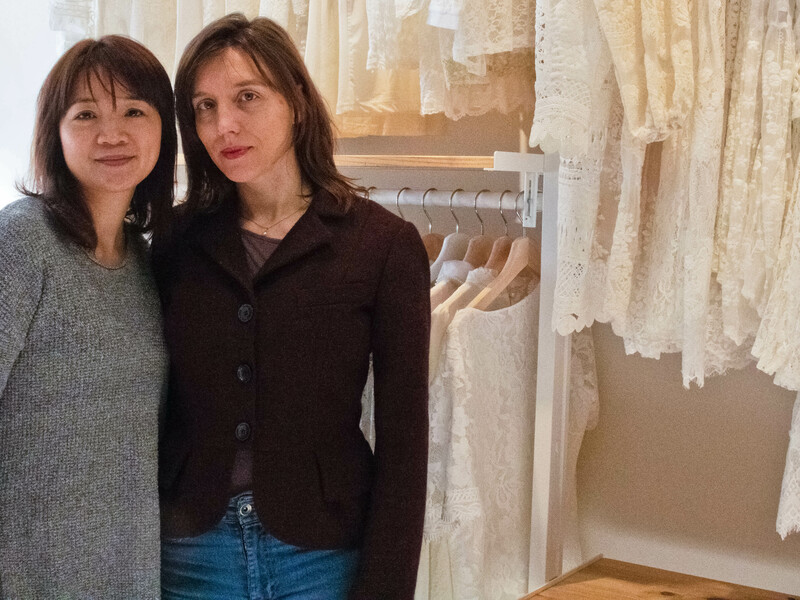 Nancy Huang, left, and Virginie Courbiere at My Sewing Studio on Danforth Avenue. Photo by Rushanthi Kesunathan. Its ten minutes to ten and Nancy Huang wipes her glass doors clean before turning her closed sign to open. Huang is the neighbourhood’s newest designer on the block. My Sewing Studio, named after the owner’s wish to be close to the community and easily accessible in the neighbourhood, opened its doors Nov. 19, 2018, at 1898 Danforth Ave. Her brand, Lacy Style, uses lace to create a chic and elegant new wardrobe for women of all ages, sizes and colour. As the name of the brand suggests, lace is the main element in her style which she buys from Canadian and Chinese sellers, Huang said. With more than 20 years’ experience in the fashion business, Huang hopes her new boutique brings the local community novelty with a unique and personalized service. The boutique retailer features a variety of colourful laces that may be tailored into dresses or gowns from wedding receptions to prom dresses. Should you need something last minute, the boutique has an array of beautiful clothing from tops to skirts and accessories for a day or evening out to complete your look. Whether you’re just browsing, picking up an outfit, or looking for personalized tailoring, styling, and other services they’ve got you covered. “We’re thrilled to bring our community an exciting, modern shopping environment where women can engage with the Lacy Style brand in a way that is convenient, highly-personalized, and fun,” said Virginie Courbiere, stylist at My Sewing Studio. Huang also organizes a fashion show for her designs every year. My Sewing Studio is well-lit and will leave you feeling energetic and hip. Every area of the store space has been carefully and thoughtfully designed to bring shoppers a personalized experience at an affordable price. Huang offers free consultation focusing on styles and colours to analysis of body-types and skin tones. “We often draw inspiration from various types of fashion trends and even elaborate with pictures brought to us by our clients,” Courbiere said. The boutique retailer also has a personalized bar giving clients an opportunity to customize and alter every item, from skirts to dresses. On-site stylists help shoppers define their personal style and wardrobe through an array of elegant, glamorous, and modern clothing, including party-ready dresses, skirts/shorts, and tops. Shoppers can choose a fabric of their choice and even have it made to measure. Huang’s curated selection of ready-made contemporary styles and designs will make a statement and elevate your wardrobe.